A lot of the drama in our lives takes place in our own heads. It’s often not the situations we find ourselves in that cause drama, rather how we react to these situations. On occasion, we’re too deeply involved to recognize that things aren’t actually as bad as they seem. The roles in the drama triangle are strategies that the ego creates in order to manage its anxiety about what it doesn’t like. The Victim sees themselves as being at the mercy of a Persecutor. This is a person, event, or situation that’s having a negative impact on their life and they’re hoping for a Rescuer to come and save the day and fix everything for them. Playing these roles can limit our effectiveness and prevent more creative ways to deal with the challenges we face. Being a victim is an identity that we create for ourselves. Most of us take on this role every now and again. For others it can be the state we live most of our lives in. It’s where we hold beliefs about how unlucky we are, how awfully we are treated by others and what terrible situations we find ourselves in. Adopting this victim mentality takes away our personal power. It means that we often avoid taking responsibility for the outcome of a situation. This is due to the belief that we are not in control of our own lives but rather at the mercy of others or the situations we find ourselves in. It limits our ability to find solutions to our own issues or solve problems. The Persecutor can be a person, a situation or a condition. It can be an illness, a colleague, your boss, the weather, a natural disaster, anything that creates a sense of helplessness in the Victim. The Persecutor is the ‘bad guy’ in the drama triangle. The Victim takes the position of placing all the blame for their situation on the Persecutor, reinforcing to themselves that they are helpless to control the situation. It’s so easy that we blame others for the circumstances that we are not happy with. It’s much more comfortable to firmly believe that someone else is responsible for our unhappiness and the drama in our lives, rather than owning our own decisions and reactions. The Rescuer can be a person, a distraction or anything that helps the Victim escape their feelings. If you recognize the Rescuer role as something that you have a tendency to adopt, it means that you would usually like to be recognized for saving the day. The issue is that this approach doesn’t help the Victim to become more resourceful and take charge of their life, it reinforces that someone else needs to fix things for them. Rescuers often crave feeling needed. If they are surrounded by Victims it makes them feel like they are important and great problem solvers. I often find myself operating from the Rescuer role. If someone is feeling upset, anxious or unhappy, I want to remove that problem for them, so I look for strategies to solve their problems for them. I feel good being recognized as someone who has been able to fix everything. The first step is to recognise that we are in the drama triangle and which role we are playing. If we see or hear ourselves in a certain situation and we can identify that we are playing one of the roles, acknowledging this can be a positive step in the right direction. Instead, we can choose to take on a more empowering way to think and take action. Rather than coming from the disempowering view of the Victim, feeling that you’re being acted upon by circumstances outside of your control, the Creator role supports you to take control of your life. Regardless of the situation you find yourself in, as a Creator you can realise that you always have a choice of how to respond to every event. Be powerful. Start moving in the direction you want your life to go in. Bad things happen that we often can’t control, but we can always choose our response to them. A great example of this is Nelson Mandela. Mandela served 27 years in prison in South Africa. He could have operated from a Victim role, but instead he chose to be a Creator. He chose how he would respond to his circumstances whilst in prison and also upon his release. Rather than swooping in to save the day, if you take the position of coach, you help the person find their own solution. A coach sees people as capable and resourceful and able to figure out solutions to their own issues. A Coach asks rather than tells. They can help you assess a situation and recognize how you’ve been responding to situations in an ineffective manner, and then support you to decide for yourself what steps to take in order to move forward. They empower you to make your own choices, never taking power from you. Changing from a Persecutor to a Challenger is a shift from blaming everyone around you and your unfortunate circumstances for all your problems, to looking for ways in which you can grow and develop as a result of the situations you find yourself in. It’s looking for ways to provoke others to take positive action. The Challenger role can help us focus on learning a new skill, acquiring some new knowledge or making a decision we’ve been avoiding. Rather than looking for someone else to blame, a Challenger provides a Creator with an opportunity to choose their response to situations based upon the outcome they desire. It can support us to learn from our experiences and take steps toward achieving our dreams. If the you are getting dragged into other peoples drama it can leave you feeling drained and unhappy. You have a few options. The most extreme is that you can stop seeing the person altogether. We want to surround ourselves with awesome people rather than those that bring drama to every situation. If you don’t want to do that, instead you can minimize the time you spend together. The alternative approach is to recognize the other persons drama triggers. Anticipate when the conversation is starting to go down the drama route and steer it somewhere else. 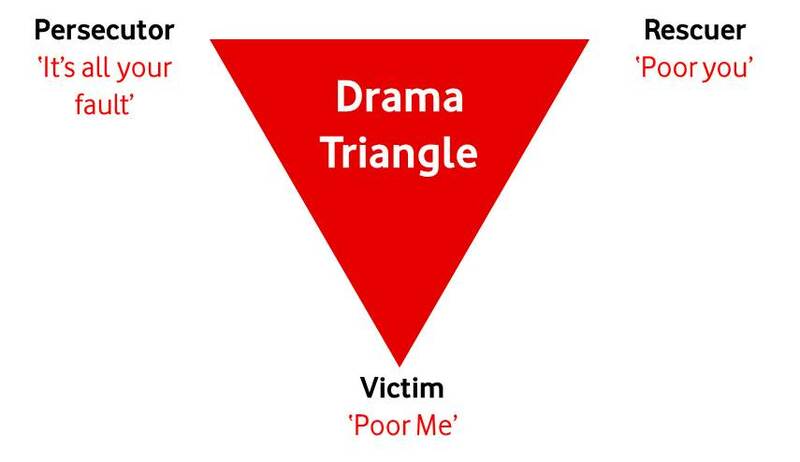 Can you recognize whether you play any of the roles in the Drama Triangle? Are you ready to make the shift to the more effective behaviours of Creator, Challenger and Coach? Please share in the comments below which role you most commonly fall into and how it plays out for you.